"Not very often is there fog in this dry climate of Montana, but when there is, it's a real treat to see. 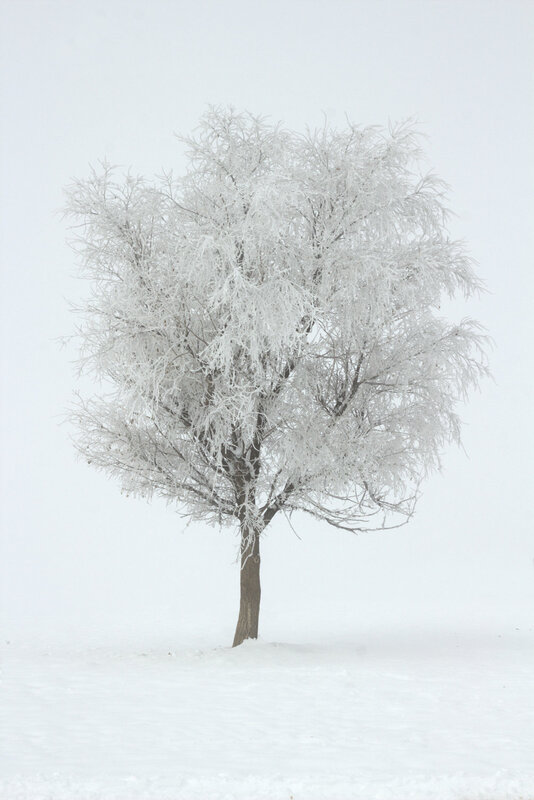 I photographed this frosted tree in the middle of our cow pen on one of those days back in November. Fantasy has always been my favorite form of art, and to me, fog helps achieve that kind of photo." To see more photos from Tessila, visit her website at tessilamcleanphotography.blackcoffeeranch.com or you can visit her on Facebook and Instagram. If you photograph portraits, whether it be for couples, families, children or even seniors, you may find that your Client wants to get outdoor photos in the cold, winter months. Even when the temperatures are cold or there is snow on the ground, you want to make sure you are prepared for everything that could come your way during the shoot. Today, we wanted to share with you a few tips to taking outdoor portraits in the winter so you are as prepared as can be and can focus on taking the best photos you can! Your camera batteries can lose their power quicker when exposed to low temperatures. In cold temperatures, the number of shots you take with one charge can drop considerably... as much as 50-70% less than you are used to. It would be awful to run out of batteries while you are out shooting in the cold weather. Be sure to keep your spare batteries warm. If you keep the extra batteries you brought with you in your inner pocket of your coat, and close to your body heat, that will be helpful in keeping them warmer. If it is very cold where you are shooting, you will most likely want to wear gloves so you stay comfortable and do not feel like you need to rush your session. You should consider using photo friendly gloves so you will be able to use the buttons and fully control your camera settings without having to remove your gloves each time. You can find these at any camera store... and you want to be sure to try them out before you buy to make sure they fit right and they work nicely with your camera. Your Clients may not think about bringing extra warm stuff along for the shoot so having an extra blanket or two in your car may be very helpful! It may even be fun to use the blankets as a prop in some of their snowy winter photos! A couple could wrap up together in the blanket or a family could lay the blanket out in the snow and sit on it. The possibilities are endless. When you are out shooting when it is sunny and bright outside, which happens during the winter when there is snow on the ground, adjust your exposure compensation by +0.3 or +0.7. Your camera will not know that you are shooting snow, so you have to tell the camera that you are shooting something bright and adjust your exposure accordingly. If you do not adjust, you will find that your snow will end up looking gray in the photos instead of the beautiful white that you are hoping to capture. Are you tired of wasting tons of time editing photos? Now you can edit quicker with The Ultimate Season Action Bundle from BP4U! Get yours today for only $9.99 (a $199.99 value)! BUY THE ULTIMATE SEASON ACTION BUNDLE NOW! Winter is here and the snow has started falling in many places around the world bringing chilly temperatures but beautiful winter landscapes. Just because there is snow does not mean that you can not get out and take amazing photos. There is nothing better than capturing the beauty and serenity of the snow. Today, we want to share 4 tips with you to help you take beautiful winter photos. So bundle up, grab your camera, head outside to build a snowman and take some awesome photography! During the winter months, the sun sets much earlier in the day so there is not as much daylight to photograph in. You want to make sure you plan ahead based on the location you are shooting in and the type of photo you are trying to get. If you will be up on a mountain and want to get the sunrise, make sure you know what time that is. Also, be sure to dress warmly. There is nothing worse than being outside trying to take that perfect shot and be too cold without a big coat, hat and gloves. Be sure to dress in layers so you can have as much warmth as you need. The cold is also bad for your camera and battery as the cold weather eats up that battery faster than normal. Be sure to carry a spare along with you, perferrably wrapped up and kept in a warm bag. Snow is bright so it bounces light around and fills in spaces in photos that would typically be a shadow. But, the problem is that your camera will probably read all of that snow as light. When there’s too much light in an image, it underexposes the photo making it very dark. When you are photographing snow, you will want to experiment with adding more exposure, so be sure to play around until you find what you like and what looks best in the photos you have taken. Something else that can be challenging when taking photos of the snow is the white balance. White balance tells your camera what color temperature the scene is that you’re shooting in. Sometimes while shooting in the snow, you may get a blue hue. To keep your snow white in photos, experiment with your ‘Cloudy’ or ‘Shady’ white balance settings to see which one warms up the photo and works best in the exact lighting that you happen to be shooting in. During the winter months, it is not very colorful. The green. colorful leaves are gone, there are no colorful flowers along the landscape and many times when it has been snowing, the sky is grey. That can give you some pretty dull shots which of course is alright if you are trying to capture a great black and white photo. What you need to do is look for any little bit of color you can find and try and capture it - no matter how subtle it may be. Use the orange and pink of the sky during the sunrise or if you are photographing people in the snow, use the afternoon sun as it shines in their faces. Do you take winter photos for your clients every year but sometimes the snow is not as heavy as you would like? Perhaps you just need to touch up the snow a bit in your photos. These Snow Overlays would be perfect for you for only $124.99! CLICK HERE TO PURCHASE THESE SNOW OVERLAYS NOW!